Chelsea have a rather irritating habit of issuing an anodyne press release trumpeting their financial results (this year on 31st January), several days before the real accounts become available at Companies House (today). Normally, the detailed figures hide a whole host of nasties not in the release. This year however, the accounts show real progress in the club's aim to meet UEFA's new Financial Fair Play rules. Football clubs find it incredibly hard not to pass increases in revenue straight on to players, managers and agents in the form of higher staff costs. It is the achilles heal of the financial side of the sport. These results from Chelsea show revenue rising by 8% and pre-exceptional costs falling by 5%, including a 2.6% fall in wages. That is a remarkable achievement. To put it into context, in the last five years there has only been one other occasion when the wage bill at any of the old "big 4", City or Spurs has fallen year-on-year. Readers who think "oh cutting the wage bill is easy, CFC let loads of old, expensive players go", should remember that United did the same last summer when VDS, Neville, O'Shea, Brown, Hargreaves and Scholes (temporarily) all left, yet we can see from MUFC's Q1 results that wage costs are still up on last year (by 12.2%). The trick is not just offloading players, it is preventing endemic wage inflation amongst the remaining squad, especially when TV money is increasing as it was in 2010/11. The only cautionary point to make about Chelsea's wage control in these figures is that Fernando Torres and David Luiz will only be in these numbers for six months. On an annualised basis they would add c. £4m to these salary figures (although there have been offsetting cost reductions from the sales of Alex, Anelka etc). Chelsea's revenue (excluding the digital JV) rose £16.5m or 8% in 2010/11. Chelsea unhelpfully do not give the usual "matchday/media/commercial" split other clubs provide. We know from UEFA figures that CFC received £10.3m in CL TV income in 2010/11 vs. 2009/10. We also know from Premier League figures that CFC's receipts from the league rose £4.9m. The table above shows quite an encouraging growth in commercial income, especially in difficult economic conditions, although at c. £60m pa, CFC's commercial revenue is far behind that of MUFC (£103m) or Real Madrid (£127m). Decent revenue growth and tight cost control meant that Chelsea made positive EBITDA (before profit on player sales and exceptionals) for only the second time since Abramovich bought the club (the other occasion was a £1m profit in 2007/08). The c. £4m EBITDA in 2010/11 is not huge (Arsenal made £47m from non-property activities) but being able to cover cash costs (pre-transfers) from earned income is a key first step in achieving financial sustainability, . The contrast with City's £71m EBITDA loss is stark. 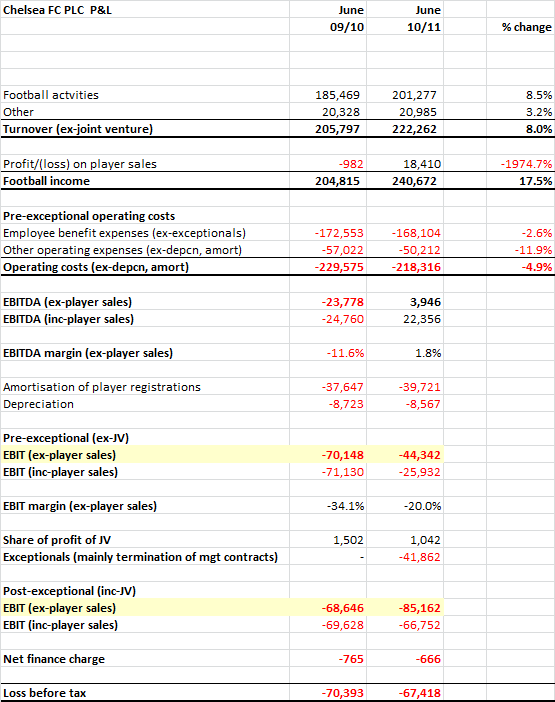 Unfortunately neither the profit and loss account nor UEFA's FFP "breakeven" calculation finishes at the EBITDA line. On the plus side, Chelsea made a profit on player sales of £18.4m, boosting EBITDA to £22.4m. After that, things get worse quite fast. At around £40-45m, the amortisation charge nowhere close to being covered by EBITDA. Once depreciation is added too, the club made on operating (EBIT) loss of £26m (inc player sales), a loss but a great improvement on last year's £71m. Now these costs are individually "one-off" in nature, but Chelsea's managerial merry go round has cost the club no less than £64m in compensation to various parties over the last four years. That is equivalent to 25% of the club's matchday revenue over that period, a staggering waste. Adding the exceptional charge, a small interest bill and the share of profit from the media JV takes the £26m EBIT loss to a pre-tax loss of £67.4m. Ignore the exceptionals and the loss would be £25.6m. This compares to £70.4m in 2009/10. There is definite progress being made. 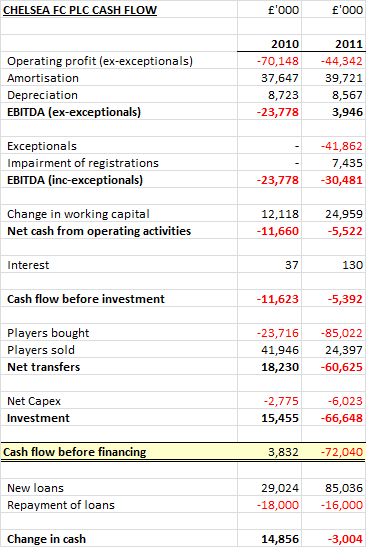 With £34.3m of the £41.9m of exceptional charges being real cash payments (the impairment is a non-cash charge), Chelsea's operating cash flow was weak in 2010/11, with an cash outflow before investment of £5.5m, but this is still an improvement on 2009/10, reflecting the far better underlying EBITDA performance and strong working capital inflows. In 2009/10, Chelsea had negative net cash transfer spend. That all changed of course in January 2011 with the (panic?) purchases of Torres and Luiz. These accounts show £112m of "intangible asset" additions on the balance sheet and a gross cash spend of £85m. As I have explained before on this blog, cash flows from transfers are very volatile but the pattern is clear. Chelsea are spending again (at least for now). 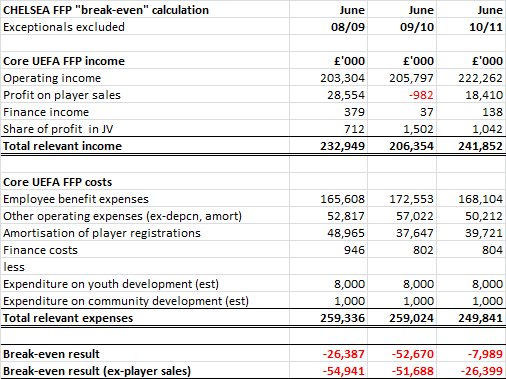 Even adding in £24m from player sales, the accounts show net cash spending on transfers of £60.6m. Add in capex and there is a £72m cash outflow before financing. This hole is filled as it is every year by loans from Abramovich's parent company Fordstam Limited. In the past, such loans are converted to equity after a while and no doubt the same will happen again. So how close are Chelsea to meeting the FFP rules? On the assumption that UEFA ignores exceptional items (and I believe it is reasonable to make that assumption, especially in the early years of the new rules), the club has made good progress. I have assumed that within Chelsea's cost base is c. £8m of spending on youth development and c. £1m of spending on community development. These items are effectively "deductible" under FFP. The table above shows that based on these assumptions about spending on youth and community activities, Chelsea have closed their "break-even" deficit quite substantially over the last three seasons. Revenue is up and costs are down. This calculation is before any player wages based on pre-June 2010 contracts are excluded under the Annex XI exemption, which will reduce the loss further. Most big clubs should be able to generate profits on player sales (academy products have zero "book cost"). 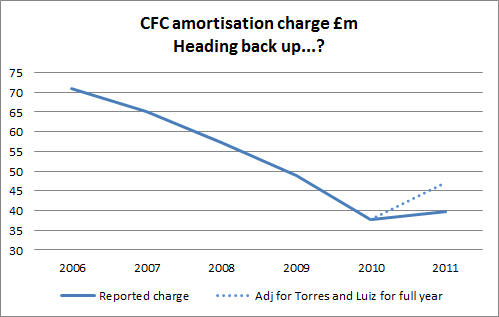 Assuming Chelsea can match the £18.4m profit achieved in 2010/11, the core deficit is only around £8m. That is well within the the €45m (c. £38m) allowable loss over the first two years of the new rules. As discussed above, the main risk to this happy position is a big rise in the amortisation charge (i.e. a further splurge of transfer spending). Five years ago the amortisation charge was £70m. A return to that level would blow a big hole in the FFP calculation. The other, ever present, risk if of course that the club will abandon it's cost control in an attempt to stay competitive on the pitch. I have written before how "six into four doesn't go" when it comes to Champions League places. Chelsea can only meet FFP with the sort of squad cost they have now by being in the Champions League. The stakes are high. Ignoring the exceptional charges (and Chelsea will pray UEFA do just that), these are impressive figures. To continue to meet FFP and to ween the club off Abramovich's cash, Chelsea will need to repeat the trick of holding down wages whilst achieving top four finishes. That is no easy task when every other club's wage bill is rising and when the squad needs a significant overhaul. The other long-term option of course is boosting matchday income from the current c. £65m pa to an Emirates Stadium like £90-100m. Maybe Nine Elms/Olympia/Earls Court etc is the answer.